NetCredit Reviews - Is it a Scam or Legit? When applying for any type of loan, it’s common to shop around for the best deal, which often involves important factors like dollar amount, interest rate, and length of repayment. However, it’s almost unheard to be able to change these factors after your loan has already been approved—especially within the personal lending space. Complete a short online form to check your eligibility, without affecting your credit score. Instantly learn if you’re eligible. Then, you’ll be able to customize your loan amount and repayment terms. After approval, you can have the money deposited into your bank account as soon as the next business day. Paying on time will continue to build a positive credit history. Taken together, this is why NetCredit claims to offer “personal loans on your terms.” Does this necessarily mean they’re right for you, though? Should you even take out a personal loan in the first place? We’ll cover it all in this review. What Are Personal Loans? Are They a Good Idea? As the name implies, a personal loan is essentially anything used for other than business (i.e. personal) reasons, including buying a car or a home, getting that RV you’ve always wanted, refurbishing your kitchen, consolidating debt, or a hundred other uses. Personal loans are generally unsecured, which means they’re not backed by collateral, such as a car or home. Because personal loans are generally unsecured debt, banks have to cover this increased risk exposure with higher interest rates (we’ll talk more about this in a moment). As such, while personal loans might be more flexible, you’ll almost always pay higher (sometimes much higher) interest rates than on lower-risk auto and home loans. If you have good credit, are looking for a small loan ($2,500 or less), and have found other options—like credit cards, secured loans, and other personal lenders—to be more expensive, personal loans might be a viable option. On the other hand, if you have a low credit score, you could pay exorbitant interest rates that greatly increase your overall expenses (this is especially true if you’re looking at a payday loan). In a worst case scenario, this interest rates could keep you trapped in a cycle of debt for years to come. What about NetCredit? We’ll discuss financials in a second, but let’s first talk about the lender’s different programs. How Does NetCredit Work? Are They Better Than the Competition? Click the “Check Your Eligibility” button on the NetCredit website. Create a personal account and provide a few details about yourself, including your source of income. NetCredit will perform a soft inquiry on your credit. Keep in mind that once you decide to proceed with your loan, NetCredit will almost certainly submit a hard inquiry, which will affect your credit score—although probably by no more than a few points. If you’ve recently applied to several other lenders though, this could cumulatively have a bigger impact on your score. Once you been approved for a NetCredit personal loan, you’ll be able to log into your account and press the “Modify Loan Details” button. Here, you can adjust the loan amount slider to match your needs, including a lower payment over a longer period of time, or a higher payment over a shorter period of time. One allows more wiggle room in your budget, while the other can reduce your total interest and pay off your loan faster. NetCredit promises to never charge additional or hidden origination fees, application fees, end payment fees, or late or NSF fees. In fact, the only “fee” you’ll pay is daily simply interest (again, we’ll talk more about this soon). With every on-time payment you make, NetCredit will report this information to the two major credit bureaus; TransUnion and Experian. With enough of these responsible payments, your credit score can gradually increase. On the fence about your NetCredit loan? If so, the company’s My Choice Guarantee gives you until 5p.m. CT on the business day after funding to return your loan, without penalty. Can all of these positive benefits help NetCredit’s customers better plan their budget and build their credit? Certainly. In these ways, NetCredit isn’t unique. However, their RightFit tool definitely narrows the playing field. In fact, they’re the first personal lender we’ve reviewed that offers this feature, while their zero-fee policy further sweetens the pot. Where NetCredit doesn’t really shine is with their steep interest rates, which can reach well into the triple digits. So, while you might have less control over your repayment structure, if you have good credit, you could score a much lower APR with a lender like LightStream Loans. It doesn’t stop there, though. For example, LendUp gives you the ability to earn lower interest rates and greater loan amounts over time, while PersonalLoans.com sends your information out to their network of lenders to find the best option for you. In other words, the right lender depends largely on your needs and preferences, not to mention numbers. Speaking of which, how much will you pay for a NetCredit personal loan? What Are NetCredit’s Eligibility Guidelines, Rates, & Fees? Depending on your state, NetCredit may be able to provide loans ranging between $1K and $10K, interest rates between 34% and 155%, and repayment terms between 6 and 60 months. Note: NetCredit loans are not available in AK, AZ, AR, CO, CT, DE, HI, IL, IA, ME, MA, MD, MN, NV, NH, NJ, NY, NC, OH, OK, OR, PA, RI, TN, TX, VT, WV, or WY. Example 1: Let’s say you take out a $5,000 loan at 90% interest, which you’ll repay over the course of 36 months. Assuming you pay the scheduled amount every month, you’ll have paid $13,500 in interest ($18,500 total) for your loan by the time everything is said and done! Example 2: On the other hand, if you take out a $10,000 loan with a 45% interest rate and repay over the course of 24 months, you’ll have paid $9,000 extra in interest ($19K total). As you can see, your interest rate and repayment schedule can have a huge impact on your total costs. In any instance though, with a 34% interest rate, you’ll still pay a lot of extra money for your NetCredit personal loan. Still have questions? NetCredit’s customer service can be reached at (877) 392-2014 . What’s Everyone Saying In Their NetCredit Loan Reviews? Depending on where you look, NetCredit seems to either have a low customer reputation, or a very high one. For example, on CreditKarma and BestCompany.com, customers gave NetCredit an average rating of about 2.5 stars. Common complaints referenced high interest rates (even for those with solid credit), frequent declinations, and long approval processes with repeated requests for additional information. On the other hand, NetCredit seemed to fare much better on sites like TrustPilot and Get.com, where most customers seemed pleased with their ease of use, fast approval process, ability to improve credit score, and helpful customer service. Although NetCredit had 33 closed complaints, the lender received an A+ Better Business Bureau rating, as of 6/23/16. Most of these referenced (again) high interest rates and different-than-expected repayment terms. Keep in mind that if you take out a NetCredit loan in FL, IN, KS, KY, LA, MI, MS, MT, NE, WA, it will be through Republic Bank & Trust Company. Loans in AL, CA, DE, GA, ID, MO, ND, NM, SC, SD, UT, VA, WI will be funded through NC Financial Solutions of California. Is NetCredit the Best Personal Lender for You? The HighYa team has reviewed some of the most popular personal lenders over the years (mentioned above), and we often find that there aren’t a lot of meaningful differences between them. When it comes to NetCredit though, their flexible repayment terms and no-fee structure are basically unheard, so they’ve definitely distinguished themselves in this regard. On the flip side, NetCredit still binds customers to extraordinarily high interest rates, which, although it’s common among personal loans, means you could pay nearly double your loan amount in interest once it’s paid off. Given this, most financial experts recommend avoiding high-interest personal loans unless there are simply no other options, such as lower interest credit cards, or even borrowing from family or friends—regardless if it’s through NetCredit or any other company. But if you must, NetCredit might represent one of the more favorable options. How did your NetCredit experience pan out? Give us all the details below in your very own review! I was initially offered a low-interest personal loan, but I end up with 99.9% interest. I was in a bind I have no choice but to bite hoping I could get this settled within a month. I borrowed initially $4000 and paid more than $3000.00 not knowing regardless of your principal loan they still base the finance charge on the original loan, meaning if you have $100 left on your loan they still charge you as if you still owe $4000. I am surprised that is even legal. Somebody has to step in and stop this highway robbery. Do not use this company. I had a loan for $3,410 after paying for five months of $300.00 a month, I decided I had to find a way to pay this loan off. When I paid this loan off, they charged me $3,311.56. This means in a five-month span, I only paid $98.00 towards my principle. RIP OFF. "Simple interest" my behind. This is ridiculous. A company should not be allowed to do this to hard working Americans, while they sit behind a desk and take your money right out from under you. I think NetCredit is a predatory lender whose lending practice that imposes unfair or abusive loan terms on a borrower. 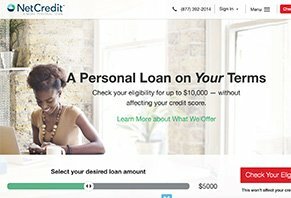 This company convinces borrowers to accept unfair terms through deceptive, coercive, exploitative or unscrupulous actions for a loan that a borrower can't afford and I am being extorted by NetCredit. I made a terrible mistake out of desperation and it made matters worse because it costs so much to pay this loan back (quadruple). The behavior by this glorified Payday Loan Company as they try to recover money from you is not acceptable and I consider as harassment. NetCredit refuses to work with consumers. Predatory lending litigation and unfair debt collection practices have rapidly increased in the United States and NetCredit is one of many Predatory Lenders. Write a Review for NetCredit!